Aluminum channels are a crucial part of any linear LED fixture. They act as a durable, lightweight housing for LED strip lighting of any color temperature, color, or output. Most importantly they act as the primary source of thermal management for your LED strips. With a variety of different styles, they allow you to create any lighting effect specific to your design objectives. 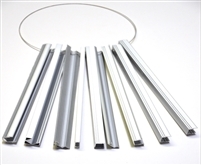 We are proud to carry the most varied selection of LED aluminum channels in 8 foot lengths, including aluminum extrusions suitable for surface mounted LED strip lighting, recessed mounted LED strips, high output LED lighting, suspended/cable-mounted LED strip lighting, and other custom applications. Some custom applications include recessed linear LED lighting into concrete for driveways, or in-between wall tiles, or LED strip lighting for stair-treads. Our wide selection of LED strip housings allow you to create virtually any LED lighting design without boundaries. Shop LED Aluminum Channels by profile type below. Aluminum Profile "S8" Indirect Lighting 78"
Aluminum Profile "S9" Hand Rail Lighting 78"